When the calendar flips to June, a gardener’s calendar notes that it’s time for peas. There’s no mystery about that, since peas take a short 60 days from planting to maturity and, because they love cool weather, are one of the first things planted. Once they bloom, it is only a matter of days until harvest. In truth this vegetable gets overlooked. That’s too bad. It’s time to overcome those worn memories of mushy peas-and-carrots in the cafeteria or as a minor player in chicken pot pies. Because they are so common and easily grown, we may think of peas as a native North American plant. Not so. Peas are first mentioned in Neolithic-era literature, showing up in Egypt, Afghanistan and Southern India as early as 9,000 years ago. More recently the English pea has been joined in popularity by sugar snaps and snow peas, as well as (when we are lucky) edible young pea tendrils, all available at the markets now. A unique combination of starch and sugar, plus healthy doses of vitamins and nutrients, they cook quickly and are easy to store for later. For the most nutritional value, eat within three days of picking or immediately blanch and freeze. This great salad makes a variety of peas the stars of the show while the dressing highlights another June garden star: fresh herbs. Mint has a great affinity for peas and should be the predominate flavor, adding cilantro and chives (or substitute parsley) plus a spark of orange and onion. The dressing should be used within one day for the best color and flavor. Try this recipe now, then tuck it away during the hot summer months until cooler fall days when peas once again come to market. Trim stems from all peas and remove strings by pulling from the top. In a pot with 4 quarts lightly salted boiling water, cook peas 2 minutes. Quickly drain and put into ice water until cold. 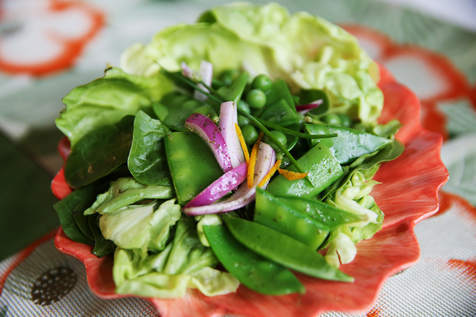 Drain and cut snow peas and sugar snap peas in half diagonally. Place in a large bowl and toss with the onion. In a blender or food processor, place mint, cilantro and chives, along with vinegar and juice. Pulse to chop the herbs. Then, with machine running, add oil in a steady stream. Pour 1⁄4 cup of the dressing into the bowl with peas and toss well, adding salt and pepper. Arrange spinach on serving plates, top with the pea mixture. Garnish with a few reserved mint leaves, whole chive stems and a bit of orange zest. Drizzle with some remaining dressing to serve. As seen in the Chicago Sun Times on June 3, 2014.